The Arts Council of Martin County invites artists to apply to be an exhibitor at the 2018 ArtsFest Stuart. ArtsFest has an attendance of 15,000+ visitors in beautiful Memorial Park in Downtown Stuart. A hometown celebration of local arts and culture, the 2-day event provides the area with exceptional fine art and craft exhibitors, a literary village, culinary arts, hands-on activities for the family, and a variety of live musical and theatrical performances. ArtsFest Stuart was chosen as a Southeast Tourism Society “Top 20 Event” in 2016. Artists are the first priority at ArtsFest. A team of volunteers are dedicated to making your experience great. To enhance sales and attendance at ArtsFest, the Arts Council uses resources and connections throughout the community to create awareness. Through the generous support from local media, promotions reach residents throughout South Florida and generate excitement about our event. From its genesis in 1988, ArtsFest has become one of the Treasure Coast’s most beloved and best-attended community events. ArtsFest has a reputation for having the best artists compared to other shows in the community. It provides significant financial support to the Arts Council of Martin County’s efforts to support the entire cultural sector. ArtsFest showcases fine artists hailing from all around the country in the juried art show. As a community-based arts organization, the Arts Council seeks to shine a spotlight on the many cultural assets in our community and bring fun, hands-on, free activities to the young people who attend. ArtsFest attracts art patrons, local residents, and visitors to the City of Stuart during Florida’s busy snowbird season. The Arts Council of Martin County is a private, non-profit organization with a 501(c)3 status through the IRS. The Arts Council is supported in part by the Florida Department of State, Division of Cultural Affairs, the Florida Arts Council, the City of Stuart, Martin County Board of County Commissioners, and private contributions. For more information, contact artsfest@martinarts.org. Palm Beach Show Group announces a call for artists for the 15th Annual Palm Beach Fine Craft Show, a juried exhibition and sale of contemporary crafts and design. Three jurors, who are experts in the field and newly selected each year, will choose 150 artists. Previous exhibitors must re-apply each year. No one is grandfathered into the show. There is no quota for any category of Craft Art. Artists are selected on the basis of the originality, artistic conception, design, and quality of their work. All work submitted to the Palm Beach Fine Craft Show must be original creations. The Show does not charge sales commissions. The non-refundable fee for applying is $35. The application fee is due at the time you fill out the online application and accept the terms and conditions. Media categories: Basketry, ceramics, decorative fiber, furniture, glass, jewelry, leather, metal, mixed media, paper, wearable art, and wood. The Palm Beach Fine Craft Show will be co-located with the renowned Palm Beach Jewelry, Art, & Antique Show which brings over 50,000 attendees over its duration in Palm Beach. Participating Palm Beach Fine Craft Artists will experience a world-class event with national and regional exposure through impressive marketing initiatives. Palm Beach Show Group is the leading full-service show production company specializing in fine art, antique, jewelry, and fine craft shows. The Palm Beach Show Group produces high-end events that create unique meeting places for collectors, art advisors, museum curators, interior designers, and dealers. The Palm Beach Show Group believes that bringing together dealers and attendees in major cities throughout the country allows for an incredible culmination of education, entertainment, and commerce. Whether young or old, seasoned or novice, a Palm Beach Show Group event creates bonds between generations. The Palm Beach Show Group produces shows in major cities throughout the United States. For more information, contact kellie@palmbeachshow.com. A&E Show Group announces a call for artists for Palm Beach Contemporary. Palm Beach Contemporary received rave reviews in 2017. Worth Avenue Magazine wrote: “This vibrant art show is the design and fashion event of the year – innovative and fresh featuring over 100 artists in an eclectic range of media…” The art critic from Palm Beach Arts Paper was equally effusive: “The well-curated Palm Beach Contemporary show… was a diverse representation of work, and if there was a unifying theme to be found it was one of transformation.” Local media called the show, “one of the top things to do” in Palm Beach County for the month of March. When A&E asked how they were found, many attendees said they Googled “Things to do in W. Palm Beach” and the Palm Beach Contemporary came up #1 in the search. A&E Show Group is committed to bringing only the ‘best of the best’ to the event and will ultimately select no more than 135 of the nation’s top contemporary artists. A&E Show Group is further committed to presenting a balanced group of artists. To that end, they limit the number of artists in each of the categories. Artists participating in this elegant indoor event will compete for $4,000 in awards, with recognition for Best in Show, Collectors’ Award and Awards of Excellence in Jewelry, Wearable, and 2D. What better place to be in early March than South Florida with its gorgeous weather, abundance of wealthy buyers, and the support of an an organization committed to your success? For more information, contact info@aeshowgroup.com. Tempus Projects in Tampa, Florida is currently accepting applications for the Tempus Projects Artist Residency program. The residency begins January 12, 2017. One artist will be provided housing and studio space for one month and the opportunity to install a month-long solo exhibition following the residency. Selected artists receive a $1000.00 stipend toward living and working expenses for the duration of their stay. Tempus Projects is dedicated to nurturing artists through exhibitions and events. The non-profit organization promotes artists and originates, organizes, and hosts exhibitions that engage the Tampa Bay community through the visual arts. The Tempus Projects Artist Residency is the first of its kind in the Tampa Bay area. For more information, contact tempusprojects.residency@gmail.com. ArtCenter Manatee announces a call for artists for Something to Talk About, an open juried exhibition. Selected work will be shown in the premier visual arts center in Manatee County. Cash prizes awarded for 1st through 3rd places and by merit. Opening reception is free and open to the public and is an opportunity to meet art enthusiasts in a wonderful atmosphere. ArtCenter Manatee is the premier visual arts center in Manatee County. We have exhibits that change monthly in our three galleries, over 350 classes for adults and children, and an Artists’ Market gift shop that features the work of over 100 local artists. For more information, contact acm@artcentermanatee.com. 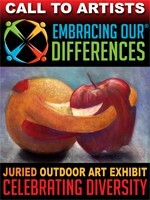 Embracing Our Differences is accepting submissions for its 14th annual outdoor juried art exhibit celebrating diversity and inclusion to be displayed April – May 2017 in Sarasota, FL, USA. Art is a powerful tool to evoke social change. Without uttering a single word, artists can enlighten, educate, and effect change around the world. Embracing Our Differences invites all artists to be a part of this change through your submissions to our juried competition. There is no submission fee or limit on the number of entries. Final selections will be made by a three judge panel of art professionals. 42 artists will be selected. $3,000 (US) in awards will be presented. The exhibit has been viewed by more than 2,200,000 visitors since 2004. For more information, contact mjs@embracingourdifferences.org. The Arts Council of Martin County invites artists to apply to be an exhibitor at our ArtsFest Stuart 2017. 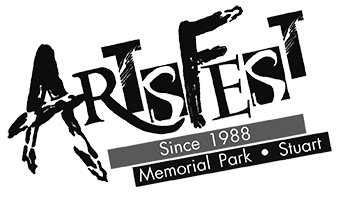 ArtsFest has an attendance of 15,000+ visitors in beautiful Memorial Park in Downtown Stuart. A hometown celebration of local arts and culture, this 2-day event provides the area with exceptional fine art and craft exhibitors, a literary village, culinary arts, hands-on activities for the family, and a variety of live musical and theatrical performances. ArtsFest Stuart was chosen as a Southeast Tourism Society Top 20 Event in 2016. Artists are our first priority at ArtsFest. A team of volunteers are dedicated to making your experience great. We use our resources and connections throughout the community to create awareness to enhance sales and attendance at ArtsFest. Our promotions reach residents throughout South Florida and generate excitement about our event through the generous support from local media. From its genesis in 1988, ArtsFest has become one of the Treasure Coast’s most beloved and best-attended community events. ArtsFest has a reputation for having the best artists, as compared to other shows in the community, and provides significant financial support to the Arts Council of Martin County’s efforts to support the entire cultural sector. ArtsFest showcases fine artists hailing from all around the country in the juried art show and talented musicians with local and regional followings. We offer a beautiful tropical setting in scenic Memorial Park in Downtown Stuart. As a community-based arts organization, we seek to shine a spotlight on the many cultural assets in our community and bring fun, hands-on, free activities to the young people who attend. ArtsFest attracts art patrons, local residents, and visitors to the City of Stuart during Florida’s busy snowbird season. Cash awards will be given for outstanding artists, in categories represented by more than five separate artists’ booths, during the ArtsFest Stuart 2017 festival, to include Best of Show and Best of Category awards. ArtsFest, the Council’s largest source of revenue for the year and with the revenues received through admission, sponsorship, and other donations, is able to provide support to the entire arts and cultural community. The Arts Council of Martin County is a private, non-profit organization with a 501(c)3 status. The Arts Council is supported in part by the Florida Department of State, Division of Cultural Affairs, the Florida Arts Council, the City of Stuart, Martin County Board of County Commissioners, and private contributions. For more information, contact note2jen@yahoo.com. Carrollwood Cultural Center (CCC) invites artists to render truth and iconology for the Illuminations: Truth and Iconology Art Show to be held September and October, 2016. Illuminations entries must contain an image and words or words that are illustrations. Ribbons and prizes will be awarded at the reception. First Prize $100, 2nd Prize $75, 3rd Prize $50. Honorable mentions $25 gift certificates to CCC. The Carrollwood Cultural Center hosts a variety of art shows in our three exhibition spaces. For more information, contact nancy@carrollwoodcenter.org. Under the Sun Promotions announces a call for artists for the Marine and Wildlife Art Festival and Craft Show, to be held September 23-25, 2016 from 9 a.m. to 6 p.m. at South Florida Fairgrounds, 9067 Southern Blvd, West Palm Beach, Florida 33411. The South Florida Fairgrounds are in close proximity to upscale downtown and a central location in West Palm Beach, the largest county east of the Mississippi. Artists and craftsmen will be exhibiting, demonstrating, and selling their works at the festival. For more information, contact info@marinewildlifeartfestivalcraftshow.com. Mattie Kelly Arts Foundation announces a call for artists for the 21st Annual Festival of the Arts. The 21st Annual Festival of the Arts is a fine art and craft show featuring 105 artists from around the country. The festival includes live music, children’s art activities, food trucks, beer and wine, a collaborative adult and student art exhibit, and strolling entertainment on the grounds of the Mattie Kelly Cultural Arts Village. Staff and volunteers work year-round to create a pleasant environment for artists to exhibit their work. Proceeds from our events go to further our mission of bringing arts education back to our area schools. For more information, contact info@mattiekellyartsfoundation.org.